The pain you experience from migraine headaches can isolate you from the rest of the world. 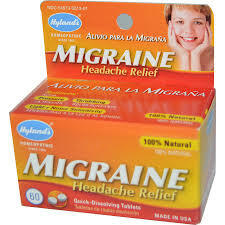 Hyland's Migrain Headache Relief is a homeopathic remedy to ease migraine headaches by temporarily relieving migraine pain. Migraine Headache Relief eases pressure, throbbing, and light and noise sensitivity, and is 100% natural, safe and effective. Migraine Headache relief comes in quick-dissolving tablets. It is a formula that works fast to relieve migraine headache pain without aspirin, caffeine or sedatives that doesn’t leave you drowsy. Homeopathy is a system of natural medicine developed by Samuel Hahnemann, a German physician in the early 1800s. He discovered that the same substance that could cause a reaction in a healthy person could also be a remedy for someone suffering from similar symptoms. That is the basic premise of homeopathy, “like cures like.” The approach to vaccination used in Western medicine is a similar one, although it is has potential side effects, unlike homeopathy which is completely safe. Hyland's is well known for its century-long commitment to making safe & natural homeopathic medicines that have no side effects. Prescription drugs have become more prevalent and complex, and their side effects are well documented. As the costs of health care continues to get more and more expensive, the need for natural medicines that are affordable, effective and available without prescription is greater than ever. Hyland is a pioneer at the forefront of a common-sense health movement in what is fast becoming the most exciting time in its long and successful history. Consumers today are demanding a more natural approach to wellness and healing. Adults and Children over 12 years of age: Dissolve 1 or 2 tablets on tongue every 4 hours or as needed.